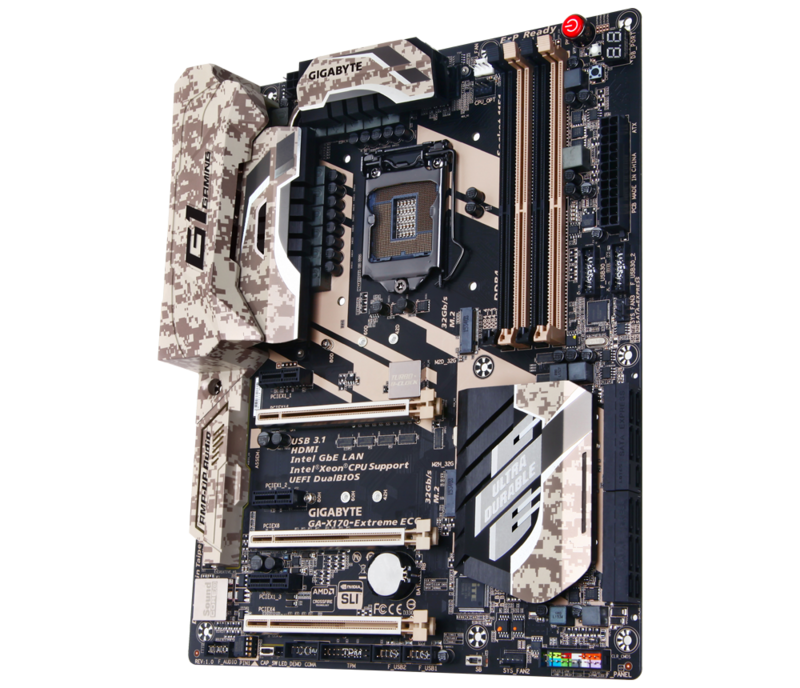 When we reviewed the GIGABYTE MW31-SP0, I stated at the time that due to the design of many of the Xeon focused motherboards, only two or three were actually geared up for SLI certification. It comes down to the motherboard implementing the C236 chipset (over the C232) and the manufacturer providing an x8/x8 PCIe lane allocation and actually going for certification. The reality seems to be that not that many Xeon users want/need SLI for gaming, hence the low number of products available. 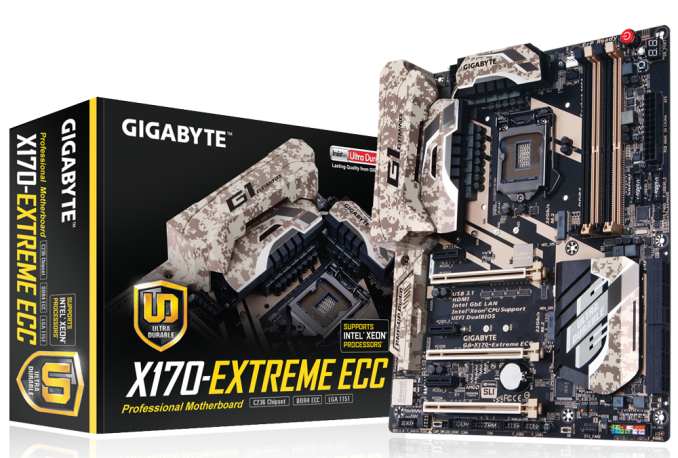 But GIGABYTE aims for the X170-EXTREME ECC to be the best motherboard on the market for just such an occasion, while bundling Thunderbolt 3 support as well. Sitting at $310, the X170-Extreme ECC is near the top of the cost pile for Skylake based systems whether the user is specifically looking at a Xeon/prosumer build or otherwise. For the money, GIGABYTE offers plausibly the consumer board with the highest specifications cable of supporting E3-1200 v5 Xeons as well as SLI, USB 3.1, dual PCIe 3.0 x4 SSDs in RAID and Thunderbolt 3 all in one package without the need for add-on peripherals. Due to the fact that Intel removed Xeon support from motherboards using consumer grade chipsets, users who preferred Xeon functionality (either for ECC or support packages) now have to migrate towards motherboards with C232 or C236 chipsets instead. C232, as we explained in the review of the MW31-SP0, is an analogue to the Q150 chipset whereas C236 is more of a Z/H170 hybrid, with up to 20 PCIe lanes from the chipset but a lack of overclocking support. The motherboards with these server grade chipsets are typically, generally speaking, engineered to work at peak rates for several years (and server grade cooling), and should be built as such. This is perhaps why a user would look at a server-class chipset while only looking at standard consumer-grade processors (C232 and C236 accept Core 6000 series CPUs as well as Xeon E3-1200 v5 CPUs). Back specifically to the GIGABYTE X170-Extreme ECC, and this element of 'over-engineering' comes through in design, aesthetics, the functionality and the price. The top GBT boards use the more expensive International Rectifier ICs for power delivery for example, as well as Alpine Ridge for Thunderbolt connectivity, and this is no exception. GIGABYTE was Intel's primary motherboard partner when the Alpine Ridge controller was launched, so it makes sense to see it on GIGABYTE's top line prosumer Xeon motherboard. For BIOS, GIGABYTE has removed the '3D' mode and reverted back to a classic (but HD) menu implementation that makes it easier to navigate. The software in the OS moves through a singular interface, unifying a design ID between various GBT features on fan profiles and monitoring, however external vendor packages such as the Killer networking interface and the Sound Blaster audio get their own implementations. GIGABYTE lacks a RAMDisk utility, which might be worth while for a prosumer system loaded up to the gills. Performance is middle of the road in our benchmarks, given the priority here is stability over tweaking every iota out of the stock performance. The X170-Extreme ECC doesn't enable any form of multi-core turbo due to the aforementioned stability focus of the market, but there still needs to be some fine-tuning, given for example the high DPC Latency. Despite that, the POST time is particularly good for a dual NIC system (Intel and Killer) with Alpine Ridge and other chipset controllers, as in fact the best POST time we’ve seen on any Skylake 100-series or C23x motherboard so far. While we had issues with testing the audio due to the Sound Blaster implementation and USB 3.1 testing due to the Alpine Ridge controller, we were able to source a Thunderbolt 3 device from Akitio with a 1.2 TB Intel SSD 750 and performance was identical to the 1.2 TB drive we tested on a native U.2 port back at launch. Nothing extraordinary came from the rest of the testing. There is only one thing that's worse than camo: pixelized camo. 1) Digital camo has been standard-issue in the military for a while now. I think it's generally acknowledged now that the digital camouflage was a failure.